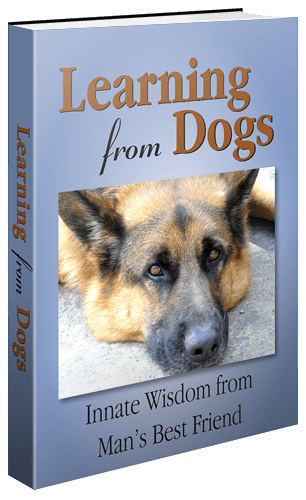 The science behind our fabulous dogs. Anyway, the dog domestication article is, of necessity, highly scientific but nonetheless worth the read. Here’s a taste from the Abstract. But what really caught my eye was Figure 1, a wonderful illustration of the links between all the breeds of dogs and the grey wolf. Neighbour-joining trees of domestic dogs and grey wolves. From:Nature. Author manuscript; available in PMC 2012 November 9. Published in final edited form as: Nature. 2010 April 8; 464(7290): 898–902. Branch colour indicates the phenotypic/functional designation used by dog breeders 8,9. A dot indicates ≥95% bootstrap support from 1,000 replicates. a, Haplotype-sharing cladogram for 10-SNP windows (n = 6 for each breed and wolf population). b, Allele-sharing cladogram of individuals based on individual SNP loci. c, Haplotype-sharing phylogram based on 10-SNP windows of breeds and wolf populations. d, Allele-sharing phylogram of individual SNPs for breeds and wolf populations. For c and d, we note breeds where genetic assignments conflict with phenotypic/functional designations as follows: 1, Brussels griffon; 2, Pekingese; 3, pug; 4, Shih-tzu; 5, miniature pinscher; 6, Doberman pinscher; 7, Kuvasz; 8, Ibizian hound; 9, chihuahua; 10, Pomeranian; 11, papillon; 12, Glen of Imaal; 13, German shepherd; 14, Briard; 15, Jack Russell; 16, dachshund; 17, great schnauzer; and 18, standard schnauzer. Gt, great; mtn, mountain; PBGV, petit basset griffon vendeen; pin., pinscher; ptr, pointer; ret., retriever; shep., shepherd; sp., spaniel; Staf., Staffordshire; std, standard; terr., terrier. Canine images not drawn to scale. Wolf image adapted from ref. 31; dog images from the American Kennel Club (http://www.akc.org). mtDNA data indicate a single origin for dogs south of Yangtze River, less than 16,300 years ago, from numerous wolves. The mean sequence distance to ancestral haplotypes indicates an origin 5,400-16,300 years ago (ya) from at least 51 female wolf founders. These results indicate that the domestic dog originated in southern China less than 16,300 ya, from several hundred wolves. The place and time coincide approximately with the origin of rice agriculture, suggesting that the dogs may have originated among sedentary hunter-gatherers or early farmers, and the numerous founders indicate that wolf taming was an important culture trait. Ancient DNA evidence for Old World origin of New World dogs. 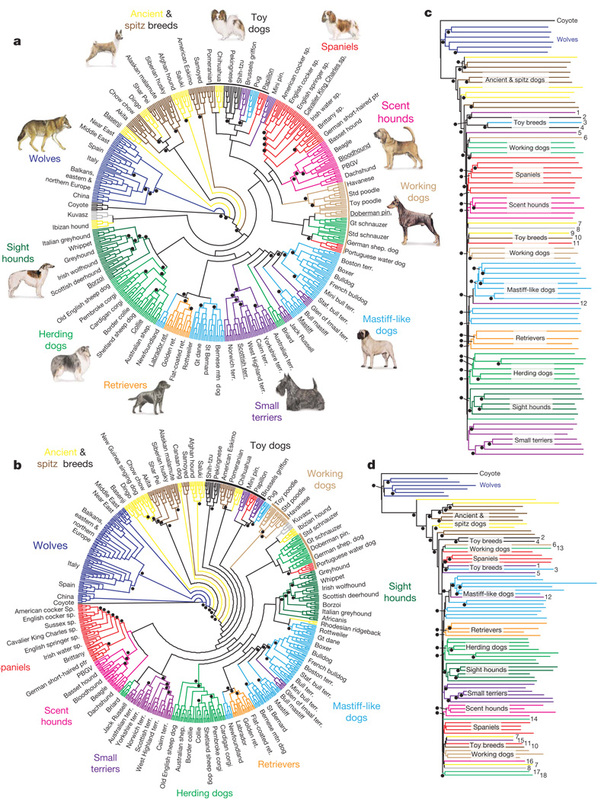 Mitochondrial DNA sequences isolated from ancient dog remains from Latin America and Alaska showed that native American dogs originated from multiple Old World lineages of dogs that accompanied late Pleistocene humans across the Bering Strait. One clade of dog sequences was unique to the New World, which is consistent with a period of geographic isolation. This unique clade was absent from a large sample of modern dogs, which implies that European colonists systematically discouraged the breeding of native American dogs. If you needed a reminder of the Pleistocene period, as I did, there’s a helpful Wikipedia entry here. The final link that I wanted to highlight was this one, for all dog owners who worry about the health of our dogs. The legacy of domestication: accumulation of deleterious mutations in the dog genome. Dogs exhibit more phenotypic variation than any other mammal and are affected by a wide variety of genetic diseases. However, the origin and genetic basis of this variation is still poorly understood. We examined the effect of domestication on the dog genome by comparison with its wild ancestor, the gray wolf. We compared variation in dog and wolf genes using whole-genome single nucleotide polymorphism (SNP) data. The d(N)/d(S) ratio (omega) was around 50% greater for SNPs found in dogs than in wolves, indicating that a higher proportion of nonsynonymous alleles segregate in dogs compared with nonfunctional genetic variation. We suggest that the majority of these alleles are slightly deleterious and that two main factors may have contributed to their increase. The first is a relaxation of selective constraint due to a population bottleneck and altered breeding patterns accompanying domestication. The second is a reduction of effective population size at loci linked to those under positive selection due to Hill-Robertson interference. An increase in slightly deleterious genetic variation could contribute to the prevalence of disease in modern dog breeds. Have to say that there are some fabulous learning opportunities from the enormous range of websites available nowadays. The amazing thing is how many varieties of dog there are now since the wolf became domesticated.